Anna Soltys, Kamelia Hristeva and Michal Taylor apply ceramic tiles to the LaSalle II mural along Division Street, behind Jerzy Kenar's familiar mound sculpture at left. 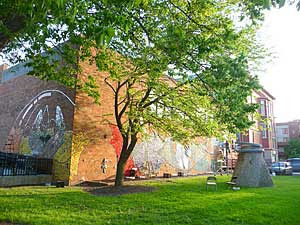 Pupils at LaSalle II and Andersen schools are working toward the June 3 dedication of a mural that wraps around the Division Street side of the building at 1148 N. Honore. The students are aided by Kamelia Hristeva and Anna Soltys of Green Star Movement, which has built murals in several Chicago schools and parks, including Columbus School at 1003 N. Leavitt and Independence Park at 3945 N. Springfield. 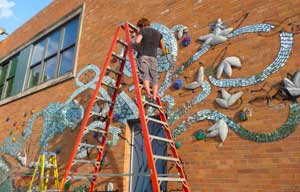 The bricolage mosaic incorporates recycled ceramic and reflective glass tiles and student-produced decorations. The design features the globe symbol that appears on the LaSalle II website and scenes suggesting the magnet school's foreign-language instruction in Arabic, Mandarin, Spanish and Urdu. Students from both LaSalle II and Andersen have embraced the project, Hristeva says. Neighborhood school Andersen will be merged into LaSalle II this fall. The Wicker Park Bucktown special service tax district is funding the mural, along with contributions from local businesses, says Betancourt Realty president Joe Betancourt, who is LaSalle II's green program coordinator. "The design reflects what we believe is the strength of the schools," Betancourt says. A ribbon-cutting ceremony is scheduled for 1:30 p.m. June 3 on the school grounds. The ceremony was postponed from this week because rain had delayed mural construction. Meanwhile, Christy Webber Landscapes has begun replanting the Honore Street sideyard of the building, with Webber herself operating a small Bobcat earthmover early Monday evening.